After the introduction of unstaffed convenience stores and cashier-less karaoke booths, self-service bank branches now look like they are becoming a reality. 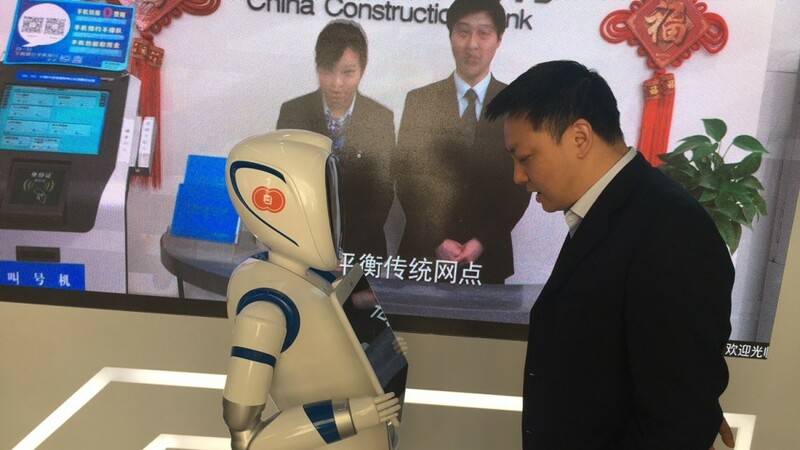 China Construction Bank (CCB), the nation’s second largest lender by assets, opened one in Shanghai this week, run by pure technology including facial recognition (FR), artificial intelligent (AI) and virtual reality (VR). The 165 square metre ground floor outlet on Jiujiang Road in Huangpu district is equipped with several smart automated tellers capable of a range of services, including account opening, money transfer, foreign exchange, gold investment and the issue of wealth management products. The bank says the new set up will be able to handle 90 per cent of the cash and non-cash demands of traditional banking outlets. For a wealthy client in need of human help, however, a private room is reserved for remote chats with client relationship managers – via video link. The branch’s creation, however, isn’t to everyone’s liking. Ada Shen, a CCB retail client, said she would not being going to the branch, not even just to experience the new kit. 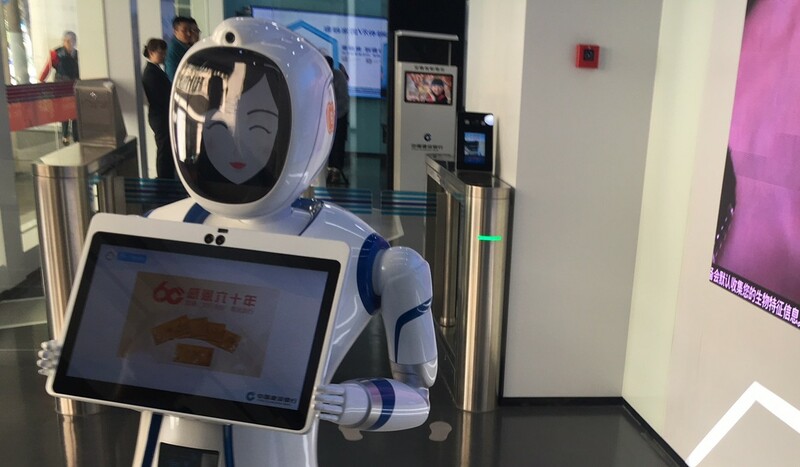 “I’m fine with mobile banking and smart machines available at traditional branches,” the white-collar worker in her 30s told South China Morning Post. Using the branch is certainly surreal. First time visitors have their ID card scanned before gaining access. Customers are then offered a queue number by the robo-assistant. On subsequent visits, face recognition will be enough for the system to access customer information. Interestingly, on the day the Post visited, the outlet had also attracted the attention of at least two curious rivals, eager to see how far a traditional bank can go in applying new technologies and services. And the reaction from customers? One said the lobby needed improved, as an adult has to crouch to engage in close contact with the robot. While a digital banker from another mid-sized lender, who declined being identified, said what most impressive him most was the VR machines, which are already frequently applied by the retail sector, but seldom seen in banking. He Fei, a senior researcher at Bank of Communications in Shanghai, said the unstaffed branch will act as a good test ground to garner customer opinion. “There will be ample room for improvement, through daily operation,” he said, although he did not think the technology will become widespread. “Unstaffed services can solve repeated and standard demands from mass clients. But human bankers are still needed to offer professional advices, to serve the complicated and personalised demands, for instance by wealthy clients,” he said. At the end of last year, 228,700 branches had been set up in China with 802,600 self-service machines, according to the China Banking Association data. Among them, 113,900 are considered “smart” machines that offer services beyond cash deposit or withdrawals. In 2017 alone, the association figures show banks revamped 5 per cent of total branches, in the aim of making them “smarter”. Today, automation tools are largely isolated and segmented into their own fiefdoms. A website chatbot doesn’t typically interact with a customer service employee unless it is programmed to hand off a conversation if certain conditions are met. RPA has been shaped by three main categories: screen scrapping, workflow automation and artificial intelligence. Screen scarping is the process of collecting display data from legacy applications so that data can be displayed by more user interface. Robotic process automation, or RPA, is a new type of business process technology leveraging artificial intelligence. Its uses span the realms of doctrine, organization, training, materiel, leadership and education, personnel, facilities and policy.